Jordan Shane Terry is a professional manual therapist working with the structure and flow of the human body- helping people to move better, feel better, and of course, play better through the use of movement, touch and awareness. Jordan started studying the Architecture of structures with actual buildings, graduating with a degree in Architecture from University of Maryland College Park in 2005. He made a rather simple, yet beautifully complex, change to the structures of human beings by bringing his understandings of physics and flow to the human body, and therefore, body therapy. Beginning in the Spa industry, switching to Orthopedic massage, and then to finally opening his own business, Fundamental Body Therapy, Jordan has pursued an in-depth understanding of the Central Nervous System and how to affect each client through the use of Neuromuscular Therapy, Integrated Cranial, and Proprioceptive-Deep Tendon Reflex (P-DTR). His most recent study and addition has been that of movement, very fundamental movements related to walking, in the form of Anatomy in Motion from the author of What the Foot?! by Gary Ward. Jordan’s bodywork has always had a focus on “fix-it,” or a “make-it-better,” style of bodywork, while still always seeking to empower clients with as much knowledge and self-awareness as possible. His work is said to, “Help people integrate into their physical bodies, and in-habit them,” and often takes form as Human Software Engineering for better change and self-empowerment. Currently, Jordan is also an Instructor at Santa Barbara Body Therapy Institute (SBBTI). He teaches Trigger Point Therapy, Integrated Cranial, Spa Deep Tissue (in the past), and Muscle Physiology/Kinesiology at SBBTI, as well as, traveling to Australia, Taiwan, and all over California to help teach NeuroKinetic Therapy. 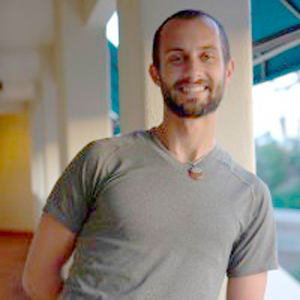 He has developed, taught internationally and is available to teach in the future to teach to courses focused on the Cranials – “Holding Space” and “Opening Space” for a weekend seminar that helps health professionals identify, integrate, and treat the central-hub of the human, aka the cranium, into any healing and movement modality. Kendra has done an excellent job of treating me for migraines, not only has she reduced the number and severity of them, she has also taught me a lot about posture and the importance of staying healthy.